My husband and I are what could be called "foodies." We enjoy sampling and discovering new and different foods from all areas of the world. Hors d'oeuvres for St. Patrick's Day or Any Day! 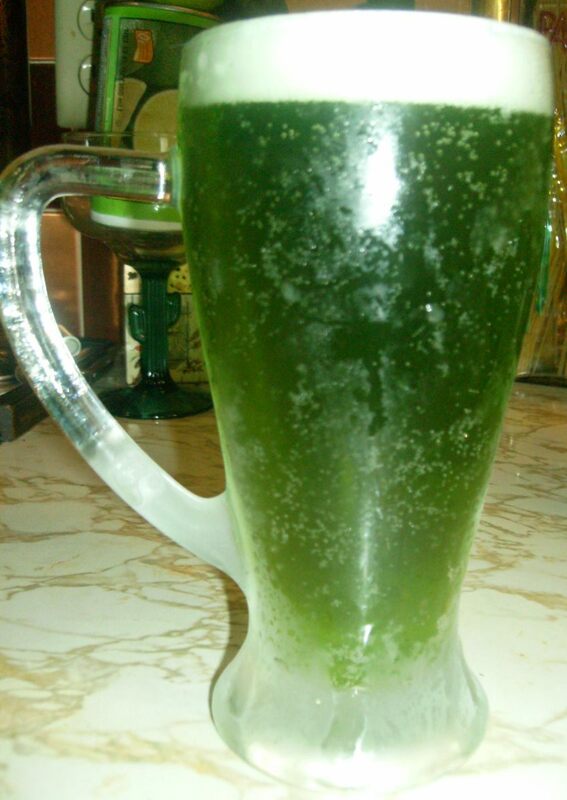 When thinking of serving perfect bite-sized hors d'oeuvres in keeping with the color green for St. Patrick's Day parties, this old recipe from one of my mother-in-law's best friends who lived in San Antonio, Texas, came to mind. We had tasted these delicious spinach balls at my mother-in-law's home many years ago after her friend had given her the recipe. 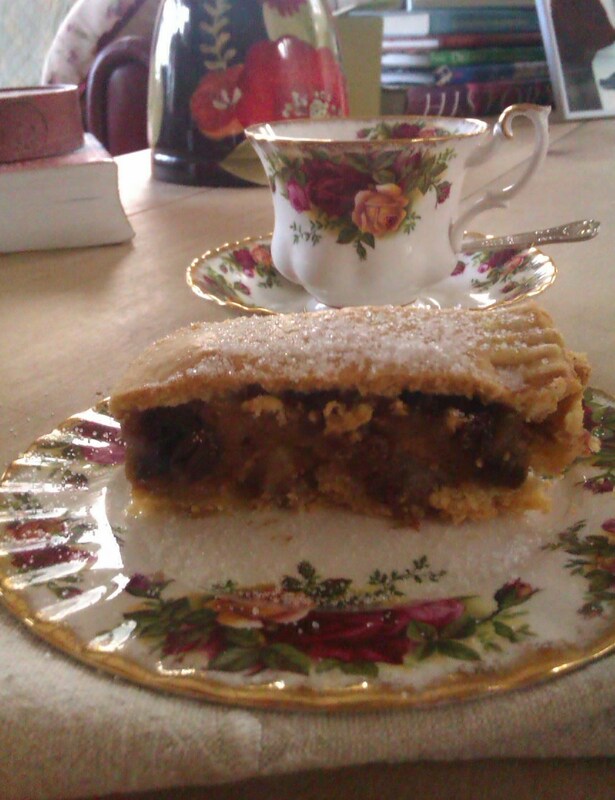 When I was looking through my mother-in-law's recipe box and saw it, I was delighted! I had forgotten all about it but instantly remembered how we all really liked these tasty creations. These little morsels of delectable goodness are not just for St. Patrick's Day. Now that I have found the recipe they will be made year round for many different occasions. Since we will be joining friends this Sunday I thought that these would be perfect accompaniments to the rest of the meal. The really nice thing is that they can be made up ahead of time and even frozen. When wanting to serve them just defrost and bake. I love recipes where one is not busy fussing with food at the last minute but can enjoy the conversation with guests. Don't you feel the same? Remember your mother telling you to eat more vegetables? 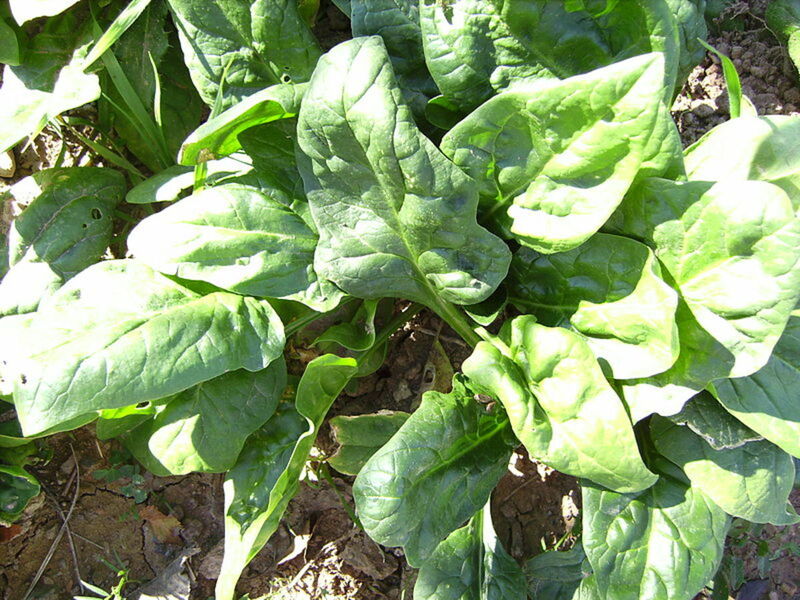 Spinach is one that you should consider if you are not already eating it. There are many health benefits attributed to eating this dark green leafy vegetable. It is a low calorie food packed with nutritious nutrients. Take a look at the video above to learn more. Remember Popeye the Sailor Man? It did wonders for him! 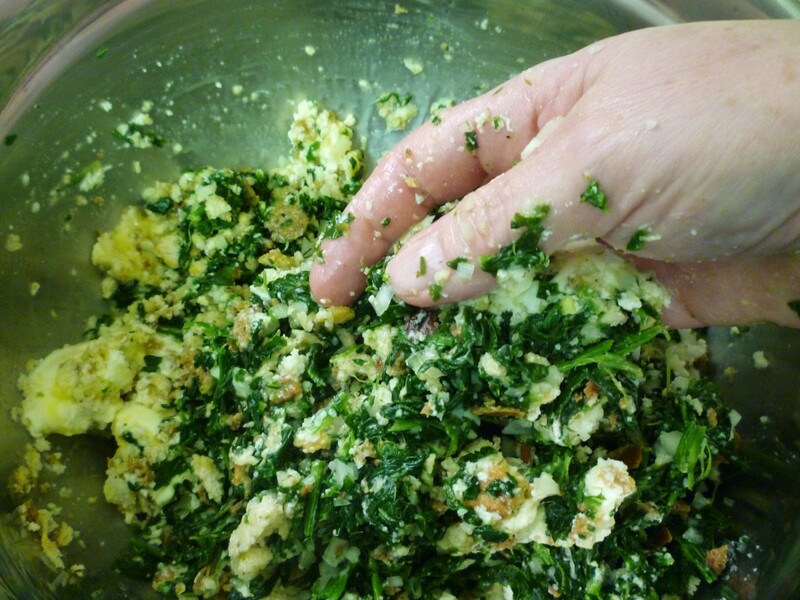 Okay... let's get busy making these delicious spinach balls! These directions are really easy to follow! After cooking the spinach per package directions place into a colander and drain the cooked spinach well. In a large bowl, beat the eggs and add the rest of the ingredients. Make sure the butter is softened before you begin. 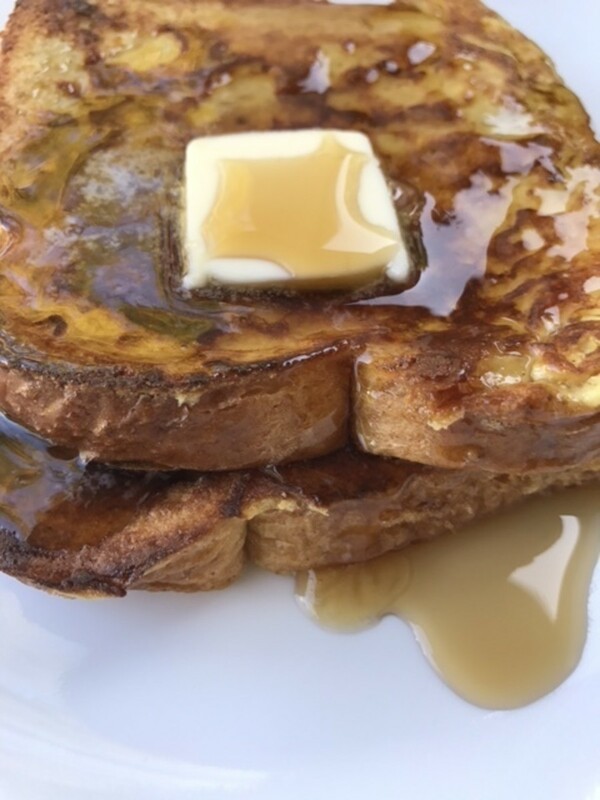 If the butter is cold from the refrigerator and you simply cannot wait to make this mouth watering recipe, you can soften the butter by putting it in a glass dish and microwaving it for 20 to 30 seconds. Just do not have it totally melted and hot or it might scramble the eggs. 4. Mix all the ingredients until well blended. Your clean hands are the best tool you can use for this. 5. Form into 1 inch balls. 6. Place the rolled balls onto a foil lined baking sheet. 7. Chill at least 2 hours in the refrigerator. Suggestion: These spinach balls can be made up to this point and frozen in plastic bags for later use. Just bring out however many you wish to bake and you will have easy to complete hors d'oeuvres for your dinner parties or a tasty treat for yourself. Just let them thaw a bit prior to baking. 8. Bake 20 minutes in a 350 degree Fahrenheit oven. Enjoy them hot out of the oven or at room temperature. They are good both ways! Makes about 60 delectable spinach balls. I told you that this would be an easy recipe to make. Enjoy and be prepared for many compliments! This has been a favorite stuffing mix used by my family for years and no turkey dinner would be complete without some doctored up Pepperidge Farm stuffing. 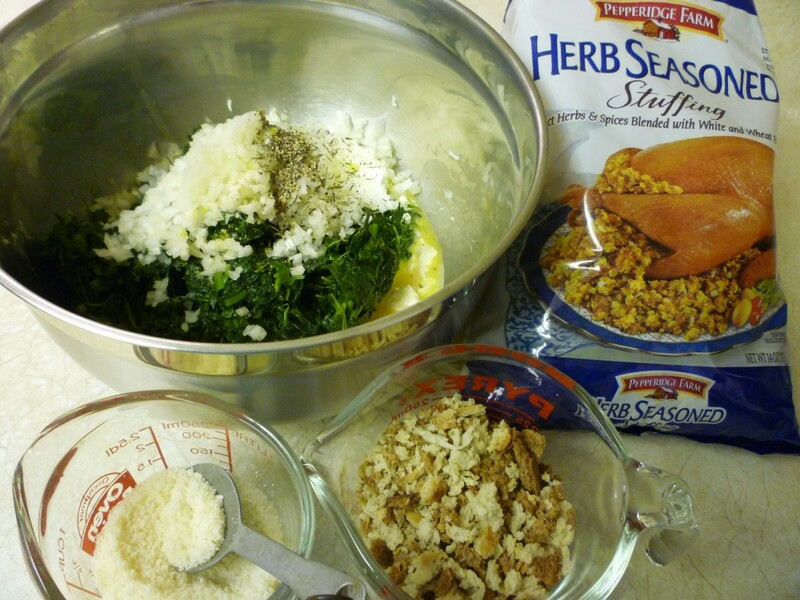 It has a nice blending of flavors with different flours to make the dried bread crumbs. They include unbromated unbleached enriched wheat flour, whole wheat flour and malted barley flour. It also has spices and onion powder. plus chicken broth in place of water. We have always loved that combination! Pepperidge Farm as a company started with the efforts of one woman, Margaret Rudkin, who turned her superior bread making efforts into a successful industry. From her kitchen to the boardroom of the Campbell Soup Company (which eventually acquired her company) plus writing a cookbook that ended up on the New York Times bestseller list, hers is a story of American ingenuity that is worthy of note. 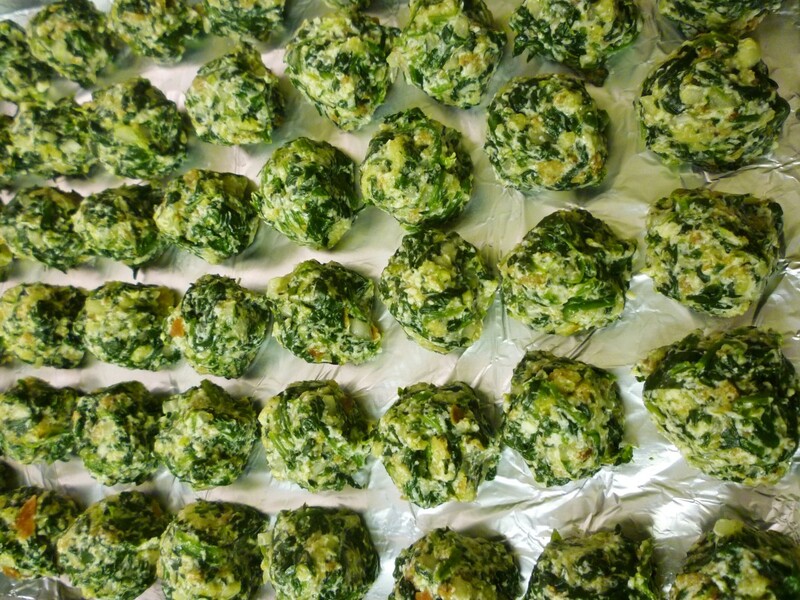 Do you think that you will be making these delicious spinach balls? Yes...I can't wait to make them! Looks too "hands on" for me. I would rather order them pre-made and ready to bake. Despite the wonders of what spinach did for Popeye, and the reported nutrients...I just do not like spinach! So no thanks! Sadly, I am on a low carb diet...so will have to pass up these good looking spinach balls for now. I am so pleased to hear that you and your card playing folks enjoy these spinach balls. Sending good wishes your way today on Halloween. The spinach balls are really easy to make and are delicious. Hope you give them a try. This seems to be an easy dish to make. The spinach balls look very inviting. Thank you for sharing the recipe. Nice to be able to share this good recipe with you. I will just bet that your card party participants will want to have the recipe after tasting these delicious spinach balls. Enjoy! Thanks for the wishes of angels. They really are good. Hope you enjoy them! These look so delicious! I can't wait to make them. 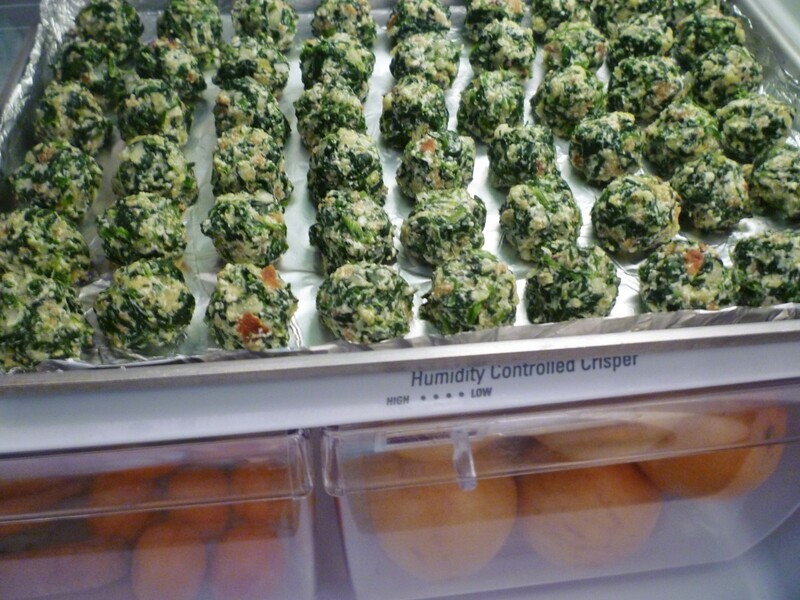 Being able to make and then freeze these spinach balls ahead of time makes them even nicer when entertaining folks as you mentioned. Will have to make some more soon! Such a perfect holiday food to include in a winter buffet. That they can be done up ahead and frozen for later use makes them extra valuable! So happy to know that you liked this article including the photos. Hope you will be giving these spinach balls a try sometime soon. They are delicious! These look so good! I love tasty appetizers. The photos are great, too. Your making a comment inspired me to update this post with the full sized photos. Hope you enjoy these spinach balls as much as we do. Thanks for posting it on Facebook. My wife, bless her kind soul, exposed me to the delights of spinach and now I find myself using it quite a lot. I posted this article on facebook and tagged my wife as a reminder for us to make them after this weekend. Thanks for sharing it. 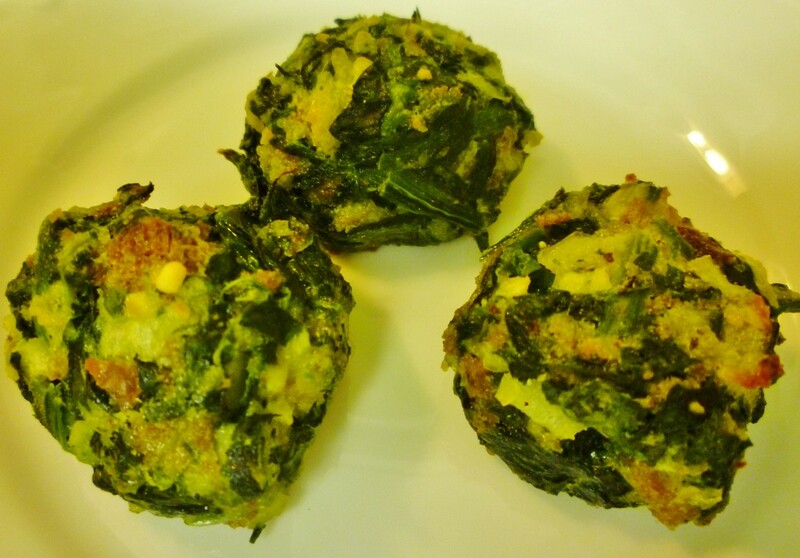 Happy to be able to share this delicious spinach ball recipe with you. Enjoy! What a great recipe! I'm right into spinach and ricotta style items, so I have no doubt that this easy tutorial will help me to make some delicious spinach snacks for the winter season. 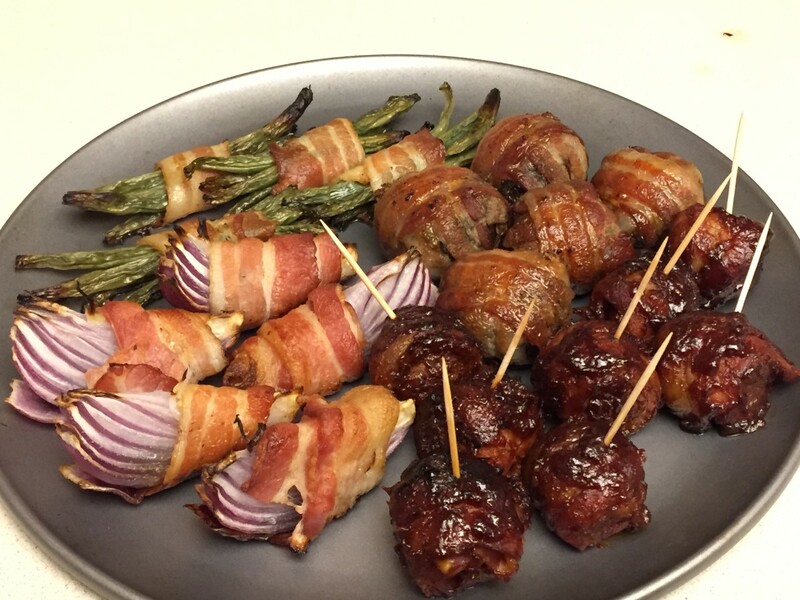 Voted awesome and pinned to my Recipes board! I was wondering if these freeze well after they are cooked. I can't wait to make these! For non spinach eaters, these spinach balls could quite possibly change their mind as the flavor of the tiny mouth sized morsel takes it in a different direction. Wishing you a Happy Easter also! I was never a spinach fan from when I was little. But now with all the things you can do with it, I can eat it in certain recipes. This is one that I can probably eat. Thanks for sharing. Looks like a very tasty snack. I think I would have to be careful since I think I could easily make a meal of these bite sized morsels. Too bad your husband cannot eat spinach due to medications he must take. Unless he does not like spinach, it would probably be cruel to make these delicious spinach balls at home knowing that he could not partake of them. Would be too tempting! Appreciate the shares. These are tasty morsels good almost anytime. Happy Easter to you and thanks for the share. These look really great, I could make this a meal. Unfortunately my husband is warned away from spinach due to a medication interaction. Sharing--- etc. Great for before dinner on Easter -- or any time. These are so yummy and healthful too. With a big holiday weekend coming up, gonna share these again. 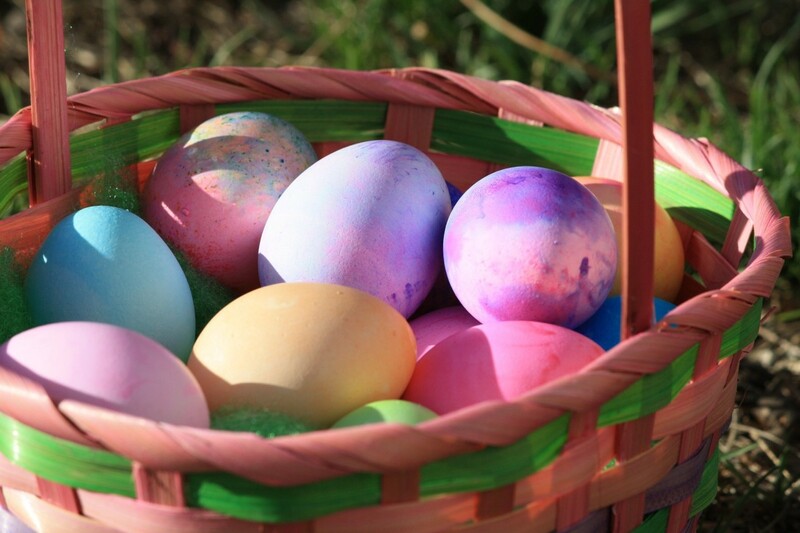 Hope you and your family have a wonderful Easter! So glad your sister made them; brought them with her and that you got to enjoy eating them. They would be nice little substitutes for meatless meatballs in a pasta sauce. Thanks for your review of the spinach balls. My sister brought some of these yummy hors d'oeuvres when she came to visit. Mom and I really enjoyed them, Peg. They are light. And, would be great for meatless spaghetti balls. Spinach and any kind of tomatoes sauce are so good together. If I read this before, I must have forgotten to bookmark it. I know I will love these and they will be a hit at our Sunday church brunches. Thanks for a new way to enjoy one of my favorite veggies. So glad your sister tried these spinach balls and rated them 5 stars. Also happy that you will get to try them when she comes for a visit. Nice that they can be made ahead of time and frozen. I know that we will be eating it more often. My hubby also has a good recipe for linguini with clam sauce...but it is white, not red. Peggy, my sister made these yesterday, and she really like them and will make some again. She froze some of the balls to bring with her the next time she comes to visit Mon and I. So! I will be looking forward to trying some then. You recipe gets 5 Stars from my sister! You're welcome, Peggy. I made it too last night for my husband and me. He said he forgot how much he liked it. Have a blessed day. So glad you like the sound of this recipe. Just wait until you try it! By the way, we had your red clam sauce recipe the other night and really enjoyed it! It was easy to prepare and delicious. We easily halved the recipe for the two of us. Thanks again! I could tell just by reading the recipe that this was a 5 star recipe, which is what I gave it. This will be on my list of foods. Very healthy too. And, here is what me sister said, Peg. 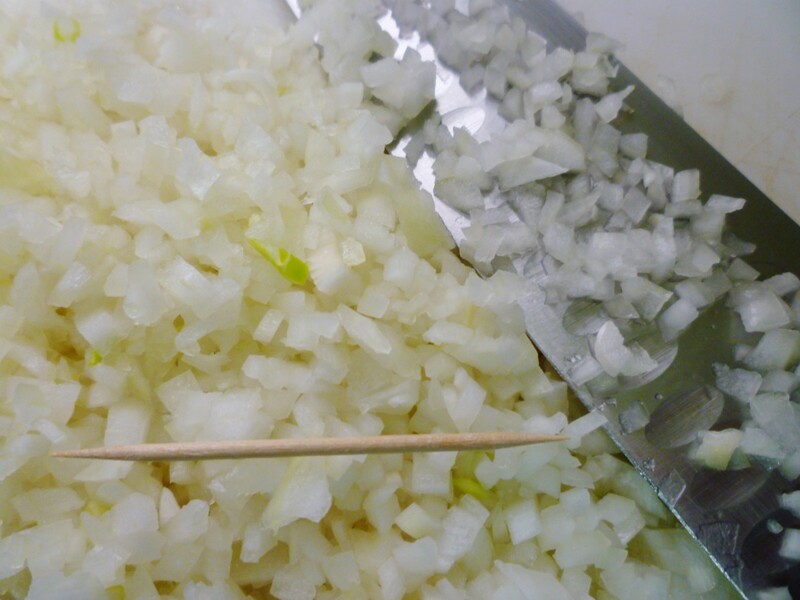 "I love the toothpick as comparison picture to make sure everyone chop the onion fine enough. 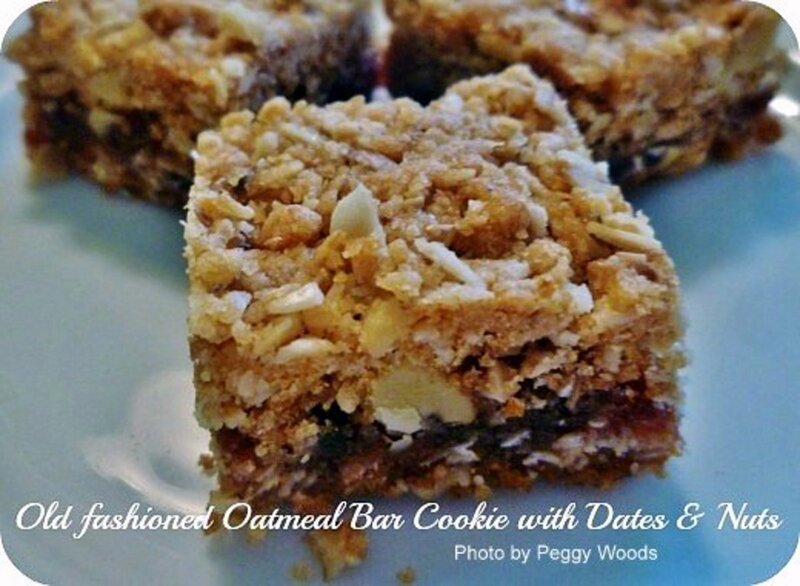 I would love these and it would be easy to 1/2 the recipe. One way to use up fresh spinach getting a little long in the tooth, just cook it up. Its a delicious sounding recipe that just might get folks eating more power packed spinach. Will certainly give it a try, have been meaning to pick up some Parmesan." Oh my, those have to be delicious. I love all the ingredients, and especially that much butter used. I just might have to try this recipe. For share I will email this to my sister, because I know she will make it. Voted up! 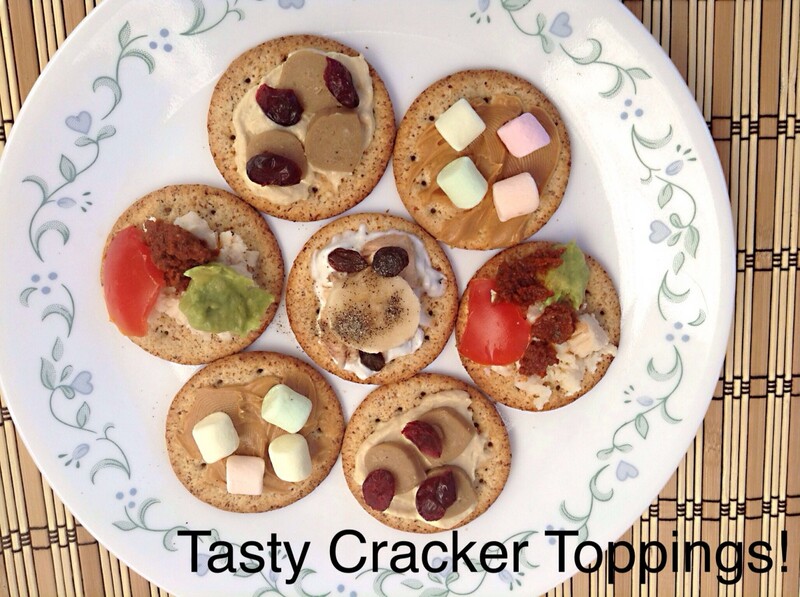 G+, tweet and pinned this yummy hub! 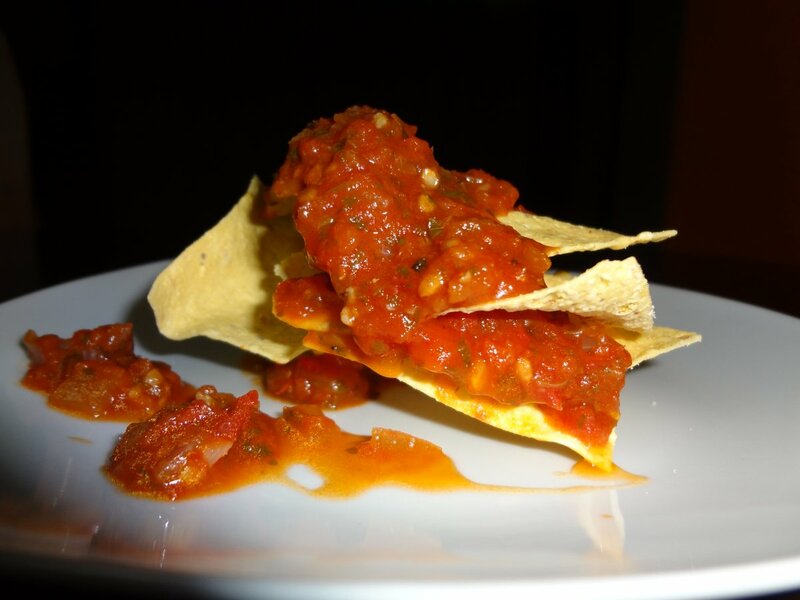 They are perfect for snacking without any kind of sauce, but if one is desired a good tomato based sauce would probably be a winner. Love to try this especially as a snack in the dock. I am already thinking of a good sauce for these. That would undoubtedly be a good substitute for those who love the flavor of mustard greens. We often keep spinach in the house for fresh salads also. Nice seeing you here! Looking forward to what you write on this site. Welcome! Thanks for the recipe Peggy, I will be making this easy recipe. I love spinach and we usually will have it in salads too. This is definitely different from stir frying spinach, but it is a tasty treat. These spinach balls are good anytime you want to serve something that is delicious to your guests. Hope you enjoy them! Seems like these would be great for Christmas too. I must bookmark this page for future parties. Thanks! So glad you like the sound of this spinach ball recipe. Enjoy! So glad you liked the sound of this recipe enough to share it. We really do like it! It is the perfect bite! So glad you like the sound of this recipe. Enjoy! I will DEFINITELY be making these. Voted Up. Would have given it 5 stars but, for some reason, it won't let me click on any of the stars. Not having that issue with any other hub so maybe you should look into that, you're probably missing out on a LOT of votes I would think. 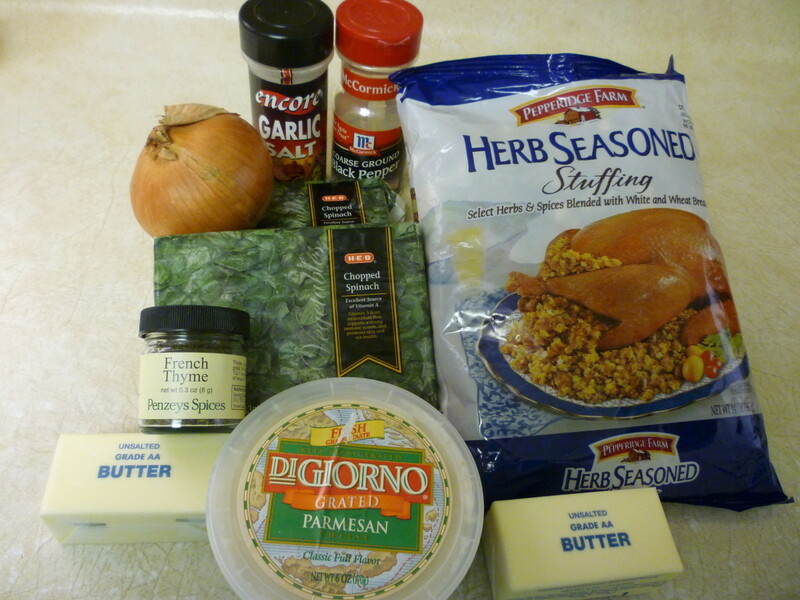 Hi Peggy W, I'm so glad I found this recipe hub. The way you have prepared the spinach looks absolutely delicious. I'll be pinning this to my recipe board on Pinterest. Rated up. I love spinach also and these little spinach balls are very tasty as an hors doeuvre. I could eat a bunch of them! This has got to be one of my favorite vegetables! Sounds like the healthiest ball style of food I'll ever try. Enjoy your Easter dinner and these spinach balls as well. Let me know how people like them. :) Hope you have a great time with your family! Hopefully these spinach balls will be as good as the ones you remember from your mother. I can truthfully say that these are delicious! Hope you enjoy them! Just came back for a reread. Instead of making spinach dip for our Easter dinner, I will make these spinach balls!! Voted UP and Pinned to my food board. Hi Peggy - my mother used to make something like these spinach balls. I can't remember her recipe so I am looking forward to trying your. The ones I remember were delicious! Wanted to tell you that I did try these, and they are luscious and easy to make-- but dangerous, too. I could eat every one! Am adding my rating into the mix. This is a simple but tasty recipe. Enjoy & thanks for the pin. Spinach is good in just about any form. We had some fresh in a salad tonight with a vinaigrette dressing. My aunt made something similar to this for our Christmas Eve dinner. They were very tasty. I prefer to have my spinach raw with a little vinegar or juiced though. Very informative Hub. Voted up. Glad that you like the sound of these! Enjoy! No reason some red pepper could not be added to these. It would be more colorful for the Christmas season! Merry Christmas to you and wishing you an early Happy New Year! These Spinach balls look delicious! It resembles the Spinach Pakoras, which we make in India. But your combination of ingredients are different and look very interesting. I would try this for sure with the help of your instructions and helpful pictures. Hi Peggy - these look so good. I think my mother made something like this. Since the Christmas holidays are coming, maybe we could add some chopped sweet red bell pepper for color. Voted up for making me hungry! You are right. There are more gatherings of family and friends at this time of year and these delicious spinach balls might be just the thing that people may enjoy. Thanks! Came back to pin this to my 'Appetizers, Snacks, & Sandwiches' board. Also, to share again because the holidays when appetizers are in great demand are almost upon us. These yummy spinach balls would be perfect appetizers. Voted up and useful again, too! Glad you liked this recipe. Enjoy! Sounds yummy. I will certainly try this new dish of spinach. They are good! I need to make some more sometime soon. Nice to have them in the freezer for quick and easy hors doeuvres. These looks really nice. Great hubs Peggy! This recipe sounds amazing. I think it would make a great snack. I will definitely be trying it. How lucky are your neighbors and family to be given fresh spinach from your garden! I am giving Swiss chard away for the same reason. I should try using some in place of the spinach in these spinach balls. Thanks for your comment and the pin. I've just planted lots of spinach in my vegetable garden. Grew so well that I had to give half the plants away! Happy neighbours and family. So this recipe for spinach balls looks good, and I shall keep it and Pin it. These look so good. Must try them. Facebooked. Hope you enjoy this great recipe. Thanks for your comment. Voted UAI and rated 5 stars. Thanks for this wonderful recipe. The share buttons seem to be missing today! That Shih Tzu picture was priceless, Peggy!! Also, this is definitely a recipe I would want to try! Thanks for sharing! If you like spinach, you will probably love these bite sized spinach balls. Hope you like them as much as we do. Thanks for the votes and 5 star rating. My lovely wife introduced me to the joys of spinach nearly 13 years ago and I am grateful to her everyday for it. This recipe will be the first thing I make her when I see her next month. 5 Stars, voted up and useful. Can't wait to try these! The best part of all is that you can make these spinach balls when you have extra time...freeze them...and then they will be handy to use when you have company. Enjoy! Thanks for your comment. This sounds like it would be as yummy as those baby quiches we see in the store, without the extra calories of the crust. I love spinach, and also anything with cheese, so I need to refer back to this one the next time I am making a tray of appetizers! I am growing Swiss chard and lots of it in our garden this year. May have to switch it for the spinach in this recipe. Am sure that it would also be good. 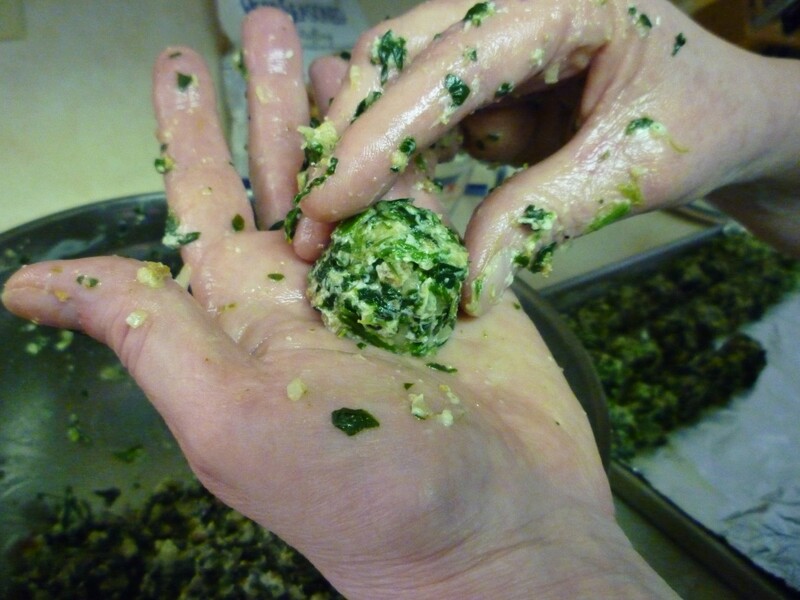 Enjoy this spinach ball recipe. It is a winner in our book! Thanks for your comment. I LOVE spinach and know I would enjoy these spinach balls! Bookmarked to be tested asap. 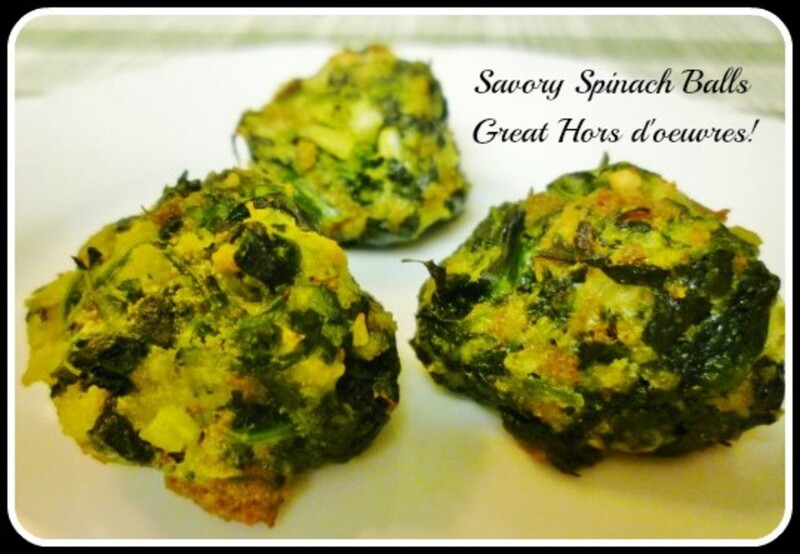 Enjoy these delicious spinach balls when you make them and thanks for the pin and comment.